The Cleaning Services Group - The Perfect Holiday House Welcome Hamper. 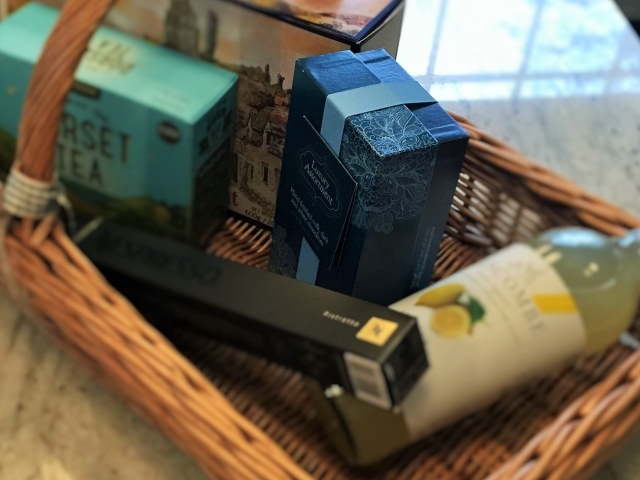 From locally sourced Lemonade and Biscuits, to fine Wine from around the world, what are the best items to have in a luxury holiday let welcome hamper? Here at the Cleaning Services Group we see a variety of different types of welcome hamper at the luxury holiday lets we clean and prepare for guests. The items in the welcome hampers have to be of a high quality, so as to reflect the standards of the property, but at the same time they must have longevity so they can be left out, sometimes overnight, for guests, and stored between bookings without spoiling. Fresh produce, although tempting, brings with it difficulties. Fresh produce needs ordering specifically for each booking, making it not as cost effective, and is subject to seasonal change. The other problem that can arise from fresh produce is the short use by date. You cannot buy it in bulk as it will not last, and if guests are delayed arriving or a booking is cancelled last minute, it all goes to waste! A good place to start when building your hamper is actually right where you are. Locally sourced products offer something unique and show a sign of quality and class, as well as giving a welcoming homely feel to your guests. Local pickles, jams and chutneys are easy to store and have a long shelf life so are a great starting point. Some harder farm cheese's that are sealed will also keep for a reasonable amount of time before needing refrigerating and are widely available from local farm shops. Unfortunately freshly baked bread is always subject to timings and can't be stored for long,however many bakeries offer bread sticks or boxes of local biscuits and cookies which stay fresh for much longer, and are always a hit with the guests. You may want to supply items that simply can't be sourced locally such as a jar of olives, a selection of dried fruit or flavoured nuts, but remember, your hamper will represent the property so care should be taken to choose quality products. With beverages you may also need to look further afield than UK producers, however it is still possible to source locally. A bottle or two of decent European or New world wine are a perfect gift for guests, especially if they have traveled a long distance, and a choice of specialist coffee or tea is essential. If you do decide to offer a local option, small breweries will offer hearty ales and crisp ciders sourced from the surrounding area, and farm shops often stock local lemonade or other fruit juice favourites. To finish, a sweet option is a nice touch. Many types of cake can be stored for long periods of time without spoiling and a box of chocolates will keep as long as the weather doesn't get too hot. At the Cleaning Services Group we service a number of luxury holiday lets, providing high quality tailor made hampers as part of our service. If you have a holiday property and you are looking for a complete service, look no further than the CSG.